You’ve decided on a crochet pattern you want to use, and picked a particular type and color of yarn. Time to consider the tools you’ll be using. All you need is a crochet hook, which might seem a pretty simple implement to choose. But it’s actually a little harder than you might think, and it’s vital you get it right. Picking the right crochet hook sizes and types will ensure your end result is just as you pictured it. Crochet hooks look like a pretty simple design, and really they are. However, each separate part has an important role to play, and contributes to the stitches in their own special way. Once you’ve got an understanding of these important characteristics, you’re well on the way to choosing the right ones for your next project. The point – This is the very tip of the crochet hook, and the part that is used to make the stitches. It’s the hook that goes through the individual stitches and loops so a new stitch can be made by grabbing onto the yarn. It’s called a point, but it doesn’t have to be sharp. Otherwise, it would split the yarn and go through the fabric, causing it to become weaker and more likely to rip. It will also make the pattern appear uneven. A sharp point is also more likely to cause injury, which will take all the pleasure out of your new hobby. The throat – Underneath the point is the throat. This part pulls and holds the new loop of yarn. It should be long and deep enough to grip the yarn, but not too big or you’ll find the loops sliding off. The shaft – This is the neck of the crochet hook, where loops are held while you continue to crochet. The size of stitches can be varied by using different thicknesses. The thumb rest – Not all crochet hooks have this, but the majority does. This is where you hold the hook by holding it between your index finger and thumb. This flat part enables increased mobility, and rotation in all directions without the hook sliding to the wrong side. This is the place where you’ll find crochet hook sizes marked. The handle – The purpose of the handle is more one of balance, as you are most likely to use the thumb rest to hold the hook. Whether you’re considering buying crochet hook sets, or individual hooks, it’s good to have an idea of the different types available. There are so many on the market, you should have no problem finding a hook that matches your needs, both in yarn type, size, and color. Steel hooks – These are usually quite thin and small, which make them more popular for thread and lace yarn crochet. They range in size from 0.75 to 3.5mm, but there are a few manufacturers that offer hooks of 0.6mm. You will often find that these thin hooks have wooden or plastic handles, as this makes them easier to hold. Standard hooks – Most commonly used with yarn, and are usually available in sizes from 2.25mm to 19mm. Variations can occur, depending on the material they’re made from. Aluminium hooks – You’ll have an easy choice if you’re planning to use aluminium hooks. They come in a wide variety of sizes, and can be used for many different yarns and thicker threads. They are very user-friendly, as their finish lets the yarns and threads slide smoothly. Plastic hooks – These are a very popular option, possibly because of their price. They are also available in a wide range of sizes. Jumbo size plastic hooks can be as much as 25mm thick, and are perfect for very bulky yarn. There is a downside, in that they can bend very easily, and have been known to break. Bamboo hooks – This is one of the wooden crochet hooks available, and are considered an eco-friendly option. Available in most of the common sizes, they are slightly rougher which makes them good to use with smooth yarns and threads. Afghan/Tunisian hooks – These are the crochet hooks you need if you’re planning to use a crochet technique with the same name. They are much longer than regular hooks, because this special technique involves leaving all the loops in a row on the hook. They may even have a point and a throat at both ends. But basically they look like hooked knitting needles. Ergonomic hooks – Repetitive injuries are on the up so many crochet enthusiasts look for something that is more ergonomically friendly. Manufacturers have filled the niche with a range of specially designed handles that fit much better into the human hand. 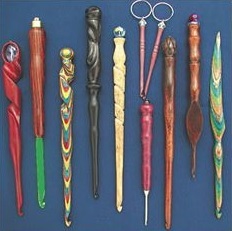 Some crochet hook sets feature a single handle, with a selection of different hooks that can be inserted into the handle. It’s said that these hooks make crocheting easier on the physical body when done for a long period of time. The shape of the handle is designed not to tire or strain the hand. Our final bit of advice on the subject of crochet hooks is to try a few out for size, comfort, feel, and ease of use before you buy. Why don’t you start your knitting projects today! knitnstyle.com is a participant in the Amazon Services LLC Associates Program, an affiliate advertising program designed to provide means for sites to earn advertising fees by advertising and linking to Amazon.com. Copyright © 2019 Knit and Style. All rights reserved.